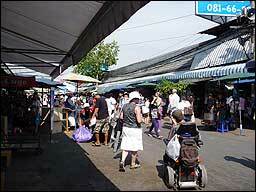 This is the biggest flee market in the world. Only in weekends and no entrance fee. Designer and second hand clothes, hand bags, shoes, linen, pets, art, table ware, cutlery, Buddha statues, suitcases and much more that you may or may not need. 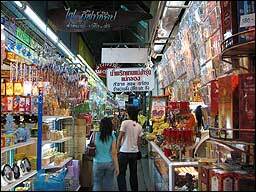 Come and spend a day to indulge yourself in Thai style shopping. 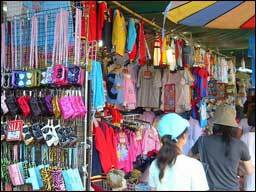 Negotiate the price and find out that prices go down to almost 1/3 of the prices in Hua Hin. Eat, snack, drink soda or enjoy a coffee. Bring your new treasures to the car where the driver waits. If you get lost or a member of your group becomes out of sight, find each other again at the clock tower in the middle of the market. Ask for a map at the information centre. A few wheelchair accessible restrooms available. Thai style access. Departure as early as possible. Shop for at least 6 hours. Return 12 hours after departure. Price includes transfer, drinking water in the car, parking fee and expressway fee. Price is exclusive of meals and personal expenses, etc.